What do you have in the first aid section? I’m not sure all the things in the first aid section at the local Coles supermarket should really be classified as such. 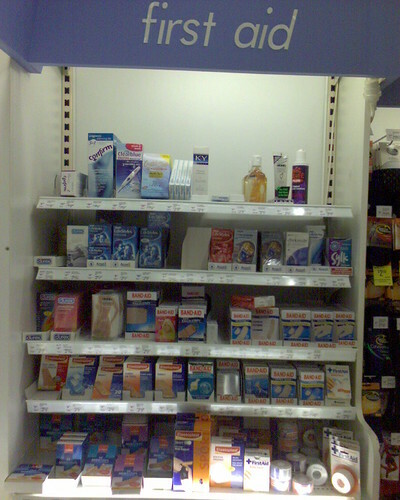 Band-aids and other bandages are a normal part of the first aid section. Now, I can see that condoms might fit. Though they seem more as a preventative measure. Although once you need a pregnancy test kit, I think you have gone past the first aid stage. This entry was posted in Photos, Shopping and tagged first aid, photo, Shopping. Bookmark the permalink.